How to order: There are products available on farm – just drive right up to the barn! For larger orders, please contact us in person, by e-mail, or phone. Payment methods: Cash, local cheque, or e-transfer. 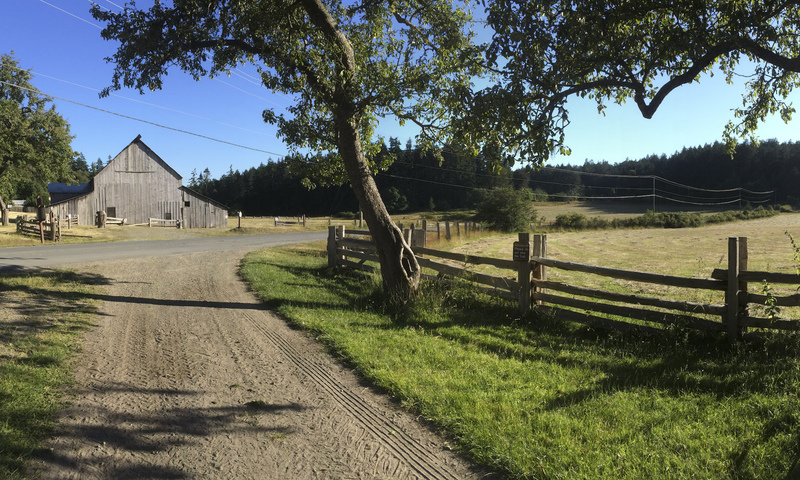 Black Sheep Farm is a 23 acre farm located on Reynolds Rd. We raise a variety of livestock for meat and egg production. We believe that healthy, happy animals are not only a pleasure to keep, but translate into a great tasting end product. Our animals are given plenty of space to move, a clean environment, and good nutrition. 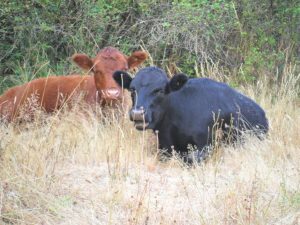 In addition to time on the pasture, their diets are supplemented by hay or greens and complete feed (specialized feed for each type of animal) when necessary. All of our animals are processed in a licensed facility. To ensure you receive what you want, please place orders now for our seasonal meats. Our Dexter cows are a breed that originated in Ireland and are valued for their ability to excell on poor pasture and in harsh weather. They are small cattle, so their impact in the land is minimal. Our cattle are supplemented with hay and complete feed when needed, as well as seasonal fruit for a treat! Our sheep are a mix of Suffolk, Cheviot, and Romney. They spend most of their time outside, until lambing time in the spring when they are kept close to the barn. The lambs stay with the dams through the spring and into the summer out on pasture until it is time for them to be processed. Our sheep are fed hay through the winter months and complete feed when needed. 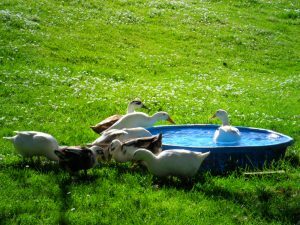 Our ducks and geese live on the farm year round and are allowed to free range in the fields, barnyard, ponds, and garden. They are fed a complete feed in addition to season fruit and vegetables. The goose that is processed for Christmas is raised by our mature geese. The eggs laid by our ducks are rich and flavourful – once you try them you won’t go back to chicken eggs! 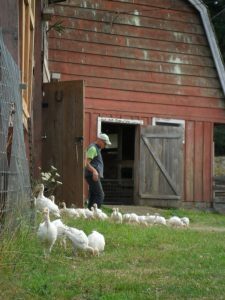 Our turkeys are with us seasonally; they arrive as day-old chicks and spend the summer and early fall on the farm eating and sunbathing in preparation to be processed for Thanksgiving. They are fed a complete feed, extra greens from our garden, and whey. 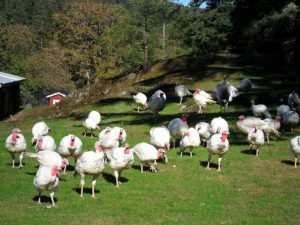 In 2017 we will raise Nicholas White turkeys and we’re excited to have sexed chicks arriving (hens only) that will produce finished birds that are more uniform in size. 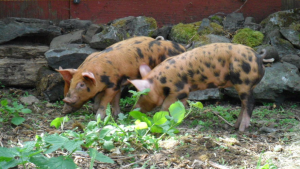 Our pigs are a cross between Berkshire and Tamworth, which are both old breeds originating from England. The Berkshire is noted for it’s marbled meat that is exceptionally tender and flavourful. The Tamworth pigs are known for their hardiness, and together this cross produces and excellent animal. The pigs are with us seasonally, arriving as weanlings they enjoy a summer of eating, foraging, sleeping and playing before being processed in the fall. Their diet includes a complete feed, garden scraps, farm fruit, and whatever roots, grubs and other goodies they root up, and whey which we believe gives the meat an added sweetness.